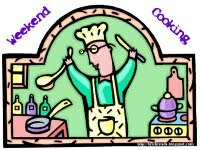 Weekend Cooking is the weekly meme hosted by Beth Fish Reads where we discuss all things culinary. Feel free to join us anytime! About two weeks ago my youngest daughter, my son’s girlfriend, and I drove about thirty minutes outside of town to a “pick your own” strawberry patch. I had discovered their location from the Pick Your Own website, which has listings available for all fifty states, plus a few international locations. This was an adventure for me, for as I have mentioned before, I do not like to drive to “foreign” locations on my own. Well, this proved to be a bit more of an adventure than I originally thought, but a lot of fun! We found the Wohletz farm with no problems, but even though we arrived before 10:30AM and I had confirmed the night before that they had plenty of fruit, they were totally picked clean! We were so disappointed. However, in true Midwest spirit, the owner apologized profusely and suggested we try another local farmer “just up the road a piece” The directions were minimal to say the very least, and I was afraid I would end up on the edge of the county without a clue how to return to civilization. However, all those fears were for naught. We found the second farm, Lawson Brothers, without any problems (and it wasn’t nearly as far out of the way as I had originally thought) and they had loads of berries ripe for the picking. The three of us picked about 13.5 pounds of strawberries in about 45 minutes time. We could have easily picked more, but it was a typical hot, humid Kansas day and we were tired and sweaty. So what does one do with that many strawberries? Well, I gave about two quarts to Amanda to take home to her mom, sugared down about two quarts for strawberry shortcake, and turned the rest into nine pints of Strawberry Freezer Jam. The recipe is fool-proof (it is available inside the box of each Sure-Jell packet), requires no sterilization or paraffin seals, keeps for months in the freezer, and tastes out of this world! I think our family has already snarfed down about two pints! I just got notification that the same farm now has raspberries ready for picking – but I am not a fan of all those seeds. However, the blueberries are just about ready at The Berry Patch and the same gang plus my eldest daughter hope to venture out next week and pick several quarts of those tasty treats that can be used in cobblers, smoothies, muffins, and pancakes. 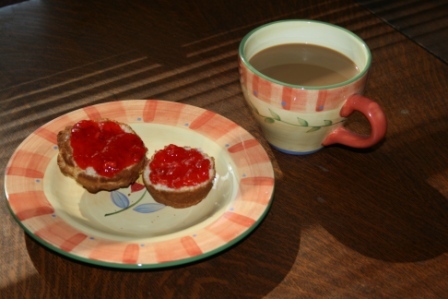 Yum–I could really go for some strawberry jam right now! I used to love to pick strawberries, but they never lasted long enough for us to make jam. I love pick your own! Thanks for the website — I need to see which local farms I may have missed. I love pick your own! And thanks for that website — I am off to check out what local farms I may have missed. I love the pick-your-own farm places too. They do all the gardening for you and you just pay for the fresh rewards. It's a win-win. Thanks for the website. That's new to me. It's fun to pick your own strawberries, but the last few years we've been lazy and bought them at the farm stand. I love strawberry shortcake, and that's the freezer jam recipe we use, too! I have never made jam…I must think about doing that. at the end of the month there will be blueberries all over the place here.. I haven't done pick-your-own strawberries since I was a kid, nor made my own jam, but next week my sister and I will do both! I'm so excited. Molly-You need to try Nutella it is awesome. I love picking my own strawberries as a child. You would eat more than what would go in the basket. I wanted to also thank you for stopping by and asking about how my husband was doing, both this week and last. He's been feeling much better, and things are finally starting to settle down around here so that I can return to visiting blogs. Yum Yum Yum! 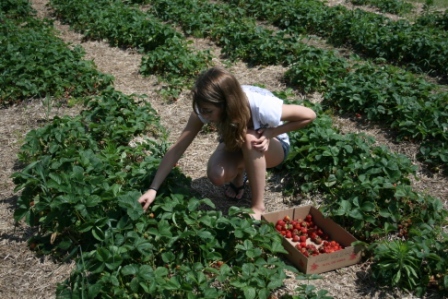 When we lived in Toronto we used to go to "Pick Your Own" farms all the time. My favorites were blueberries and apples. I don't know of any of these farms down here in Dallas, though. Homemade strawberry jam sounds delicious! And strawberry shortcake would be my favorite thing to do with a pint of strawberries. I haven't had freezer jam in ages. Now, I'm craving it. Sounds so good. We did some blueberry picking in Oregon last year and it was so much fun! I've been meaning to make strawberry jam (storebought strawberries though). 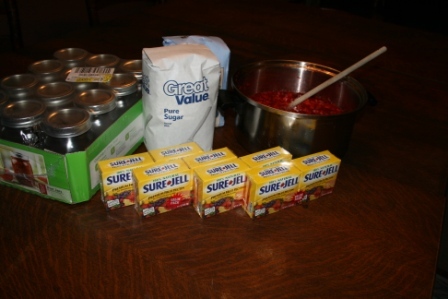 I'm going to experiment with the lower sugar recipe–hopefully it's not gross! Strawberries are the only berry we don't grow here in our little "orchard." But I love them. I'll head to the local fruit stand and pick up a bunch each year for jam…..YUM! I used to be afraid of making jam, but it's so easy.